The cashew, scientific name Anacardium occidentale, is a tree in the family Anacardiaceae which produces a seed that is harvested as the cashew nut. Its English name derives from the Portuguese name for the fruit of the cashew tree, caju, which itself is derived from the indigenous, the tree is now widely grown in tropical climates for its cashew apples and nuts. The cashew nut is a popular snack and food source. Cashews, unlike other oily tree nuts, contain starch to about 10% of their weight. This makes them more effective than other nuts in thickening water-based dishes such as soups, meat stews, and some Indian milk-based desserts. Many southeast Asian and south Asian cuisines use cashews for this unusual characteristic, rather than other nuts. The shell of the cashew nut is toxic, which is why the shell is removed before it is sold to consumers. 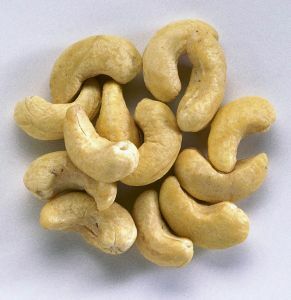 Cashew nuts are commonly used in Indian cuisine, whole for garnishing sweets or curries, or ground into a paste that forms a base of sauces for curries, or some sweets. It is also used in powdered form in the preparation of several Indian sweets and desserts. In Goan cuisine, both roasted and raw kernels are used whole for making curries and sweets. The cashew nut can also be harvested in its tender form, when the shell has not hardened and is green in color. The shell is soft and can be cut with a knife and the kernel extracted, but it is still corrosive at this stage, so gloves are required. The kernel can be soaked in turmeric water to get rid of the corrosive material before use.